Although the benefits of aftermarket audio power cables were not widely accepted at the time, Stage III Concepts was the first company to develop and produce audiophile-grade power cables using silver ribbon conductors with air dielectrics, providing audio systems with remarkable (and undeniable) improvements in sonic performance. All our experience and innovation in this field of audio, has evolved into the A.S.P. KRAKEN; which represents the culmination of 16 years of research, materials evaluation, testing and the invaluable guidance of countless customer comments and listener feedback. We have succeeded in achieving our goal of creating a power cable that knows no limits; one that can be used to enhance the performance of a wide range of audio components with literally any power requirements while offering an unprecedented level of precision and control. We developed entirely new, larger gauge AeroStrand Ultra™, air dielectric conductors especially for this cable design; so efficient they can carry more than 40 amperes without the bulk and stiffness of more traditional wire with equal current capacity. Our exclusive conductor alloy in conjunction with an impenetrable shielding matrix, a unique wire geometry plus high levels of mechanical damping, brings on definition, clarity and a noise floor to levels never thought possible; even without the use of a dedicated power conditioner. A true stand-alone statement in the vast realm of audio power cables; uniquely designed, visually stunning, hand made entirely with proprietary components and utterly invincible. A.S.P. 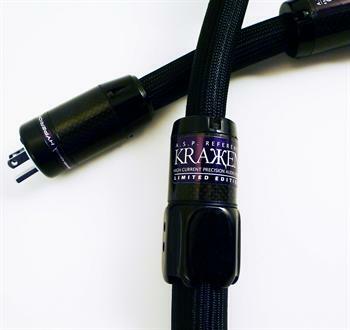 REFERENCE KRAKEN power cables employ 6 large-gauge Cryo-treated, custom slow-extruded silver/palladium AeroStrand Ultra™ ribbon conductors. Air dielectric with FEP Teflon air-tubes. H.D.A. 100% radiation invulnerable shield. Each conductor + 3 plated silver ground wires individually shielded with silver plated braid. Multi-layer construction with silica/ceramic/ferrite mechanical damping/shielding layer.